The numerous settings let you define, for e.g. how different types of page objects are handled during color conversion and what the destination of the color conversion process is. In this list you can specify the destination profile that shall be used as the destination for the color conversion. In any case, this will only have an effect if 'Convert to destination' or 'Convert only alternate color space to destination' is chosen in the Conversion list under Conversion settings. 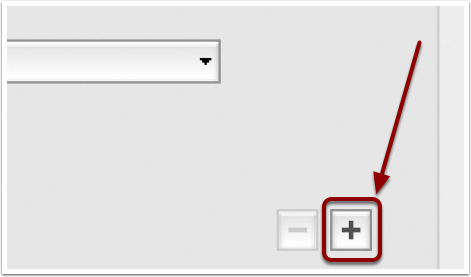 If this checkbox is activated and the processed PDF file contains an Out­put Intent, the profile chosen in the Destination list will be ignored and instead the one embedded in the Output Intent will be used. Converted objects are not tagged at all. All converted objects will be tagged with the destination profile. This will hardly ever be useful for conversions to CMYK but is almost always very useful for conversions to RGB. An Output Intent will be created for the PDF with the destination profile embedded as Output Intent profile. Note: This is highly recommended for any conversions to CMYK, as recent versions of Adobe Acrobat use that information by default for displaying on screen whereas at the same time this ICC profile in the Output Intent does not trigger any unwanted further color conversions. Note: Please be aware that only ICC profiles of type 'prtr' output profiles) are allowed in an Output Intent for PDF/X files. Embedding for example an sRGB profile (which is a 'mntr' or display profile) in a PDF/X Output Intent will make it impossible to turn that file into a valid PDF/X file (or make it an invalid PDF/X file if it already had been a PDF/X file). With this list you can specify the default profiles that will be used as the object's source profile if the object does not have a source profile. In any case, this will only have effect if Convert to destination or Convert only alternate color space to destination is chosen in the Conversion list under Conversion settings. It is necessary to have valid ICC profiles specified for all color spaces. 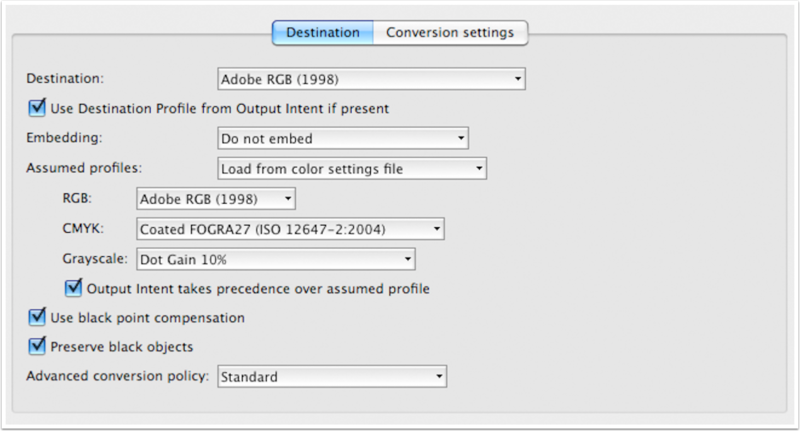 Selecting a predefined Adobe color setting here will change the settings for the color spaces automatically. Note: If you import this fixup and the used ICC profiles are not present on your system, you need to execute the Fixup once (otherwise the ICC profile may be displayed in "(...)", as it is not present on the current system yet). List of available ICC profiles to be assumed for uncalibrated RGB colors. List of available ICC profiles to be assumed for uncalibrated CMYK colors. List of available ICC profiles to be assumed for uncalibrated grayscale col­ors. If there is an Output Intent embedded in the processed file, the selected profile for the color space defined by the Output Intent will be ignored and instead the settings will be adapted to the Output Intent profile. If this checkbox is activated, black point compensation will be used for color conversion using the relative colorimetric rendering intent. If this checkbox is activated, color definitions using just the black channel will remain black. Furthermore, RGB and Lab color definitions for gray will get converted to Black only where applicable. For more information about the treatment of black objects see section Processing black objects. 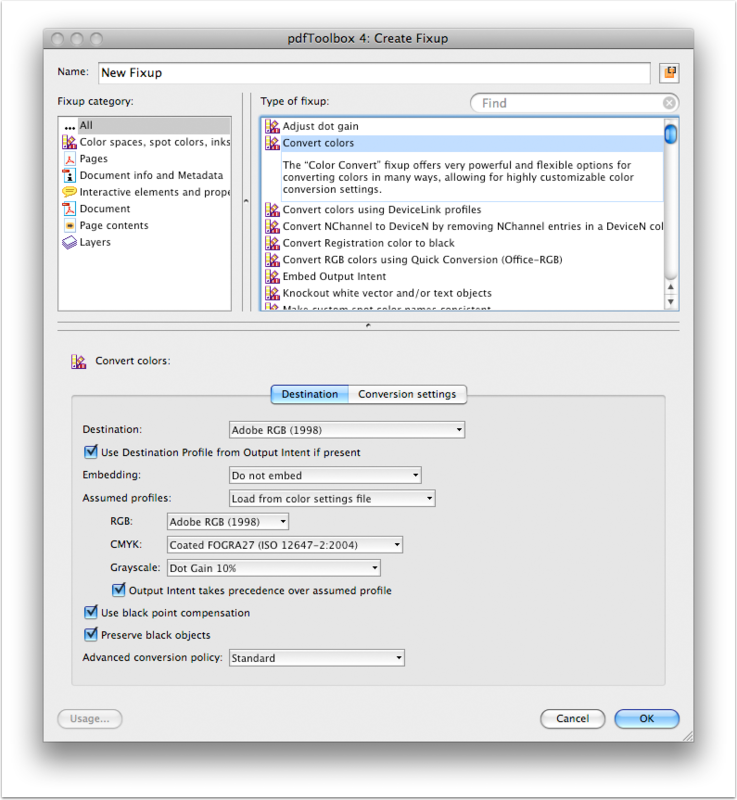 Policies allow to define exceptions and enhanced color conversion options. For more information please see section Policies . Here you can limit the execution of color conversion to a certain object type defined by a check. List of color spaces for which the defined conversion settings should be applied. Removes the source profile from a calibrated color space. Note: Removing a source profile results in an uncalibrated color. Decalibrated objects will be converted further as defined for uncalibrated colors using the same base color space. Objects are converted to the destination color space as specified by the destination settings. Removes the source profile from a calibrated color space first and converts the resulting, uncalibrated color into the destination color space. Only the alternate color space of spot colors is converted to the destina­tion color space as specified by the destination settings. Tags an object with the ICC profile of the destination if the base color space matches. Objects will not be converted. This might be useful if you want to exclude a specific object type or color space from the color conversion. If there is no Rendering Intent explicitely defined in the PDF the default is Relative colorimetric. The setting has no effect for the conversion options "Decalibrate" and "Tag with ICC profile".